We got caught up in traffic on our way home. We decided to hit the access road since it was the exit we needed anyway and go down a little further to see what was going on as there were two helos in the air a 1/4 mile up the road. All of the sudden my wife says, "that's a plane!!!!" Sure enough....it was. Seems that everyone is okay. Good job, guys! 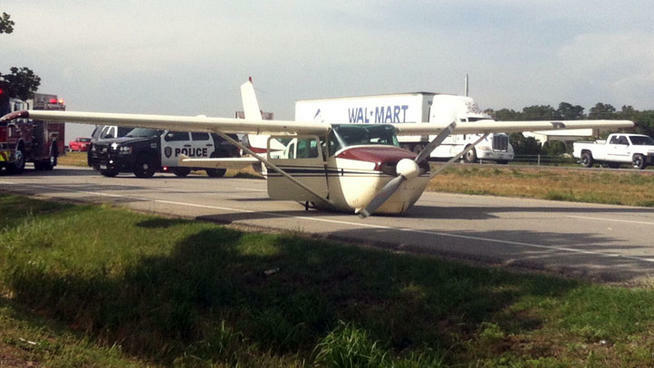 This happened just a few miles from my house and the airplane departed from airport I learned to fly at. Glad everyone is OK. I am about to make the drive past Burleson but North bound. Guess the engine failure made him forget his gear. If the plane was sitting on it's wheels who would be responsible for the aircraft? Tough call to make with the gear and the off-fieldness of it, although a nicely paved road makes a good runway in a pinch. I can't quite tell...is that an old 210 or a 182RG? The old 210s have engine driven hydraulics for the gear and so if the motor quit at low altitude, or if he was stretching the glide, he very well may not have had time to pump them down. Don't they both (182/210) have an emergency gear switch that allows the gear to gravity fall, like the Arrow? Don't they both have an emergency gear switch that allows the gear to gravity fall, like the Arrow? Cessna main gear has to go up to lock. The prop tips appear undamaged, you may be right about the engine driven pump. Not understanding. If it was up, wouldn't it be locked? I'm guessing after reading now that there is a manual pump to pump the gear down? Well, it's been a while and I don't know the specifics of the different models, but IIRC on the 172RG the gear will sort of free fall but the 210 has to be pumped off the uplocks before it will start to come down. With both of them, even once they start to gravity fall they will not lock like the Arrow, but just sort of dangle. So.... what you're saying is don't try to land the airplane w the gear down as it may collapse on the landing, anyways? No free fall, I know a DPE who opened the door and laid on the floor to reach out and lock a dangling main gear in a cessna single. That looks like a 210. 210 is an engine driven, pumping takes a while, there is no free fall, and the pilot was probably more concerned with making a survivable landing than avoiding any possible damage to the aircraft. All that being the case, I'd score that A+ in decision making. I'm not sure about the 210, but both the 172RG and 182RG have a hydraulic hand pump to extend the gear in an emergency. You must pump the gear into its down and locked position. It is not a free-fall system like you find in many Piper aircraft. Funny thing about the system is that, should you develop a hydraulic leak and lose all or most of the fluid, neither the normal nor emergency gear extension systems will function. My primary CFI was with a commercial student in a C-177RG and they had a gear failure.. pumped it down and the pump "froze", with the gear still in the dangle position. He did the same sort of trick, leaning out the door and using the tow bar. While I commend him for doing a great job in handling the situation, I'm not sure about any of that. I can't imagine the plane would be very happy landing with dangling gear, but I'm absolutely sure that I wouldn't be very happy if I (or someone else in my plane) fell out trying to force it down. I agree, I wouldnt attempt it without a qualified pilot at the controls and being well braced... would rather total the plane than fall out.